CSF uses new technology packed into a compact two-row design for better cooling capacity without the added weight. More efficient B-tubes have greater surface area for cooling (15% cooling capacity increase in fin technology alone) and a precision multi-louvered fin to increase heat rejection performance and surface area contact. Additionally, this CSF part has more total cooling tubes, and due to the efficient B-Tube shape, airflow through the core is improved as well. These technical features all contribute to improved cooling efficiency over OE-type performance upgrades, as well as other standard “performance” aluminum tanked radiators which are nothing more than aluminum tanks on a traditional stock core.Made in Indonesia in the same factory that produces CSF parts for aftermarket and car line production for several European cars. This part is a much higher level of quality than the typical Chinese factory parts. 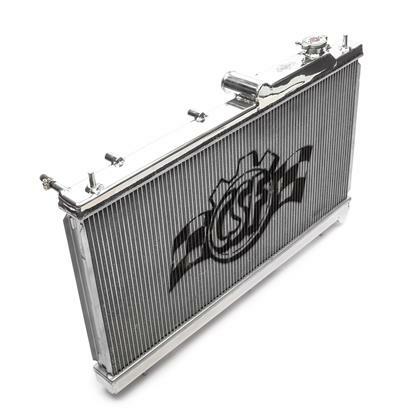 All CSF radiators come with a two year warranty against defects in craftsmanship.